There's a solid argument to be made that with the relative demise of multi-GPU technology, plus the ever-increasing levels of feature integration into chipsets, smaller motherboards ought to be more in favour. A quality Mini-ITX board of 2018 doesn't compromise on much. 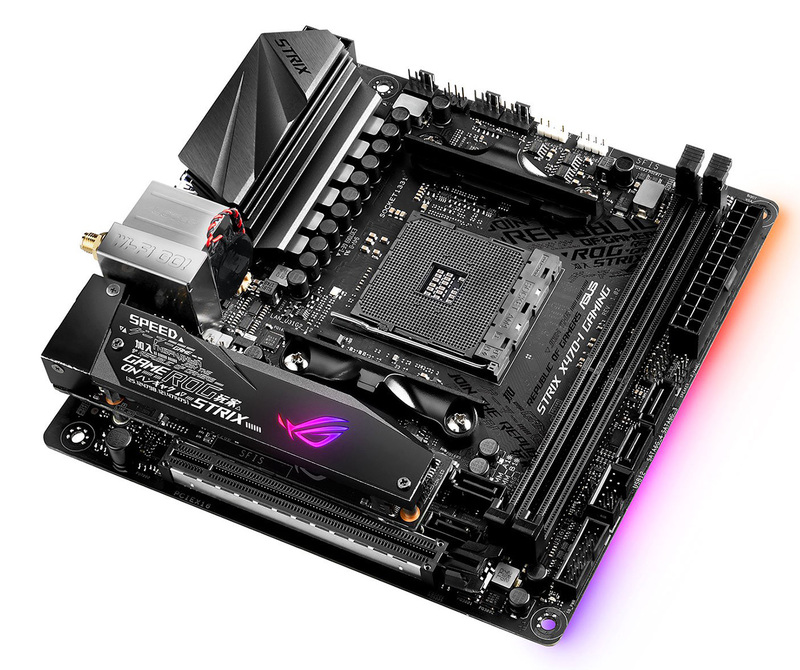 That is Asus' thinking too, and it has released said form factor for AMD's X470 chipset. 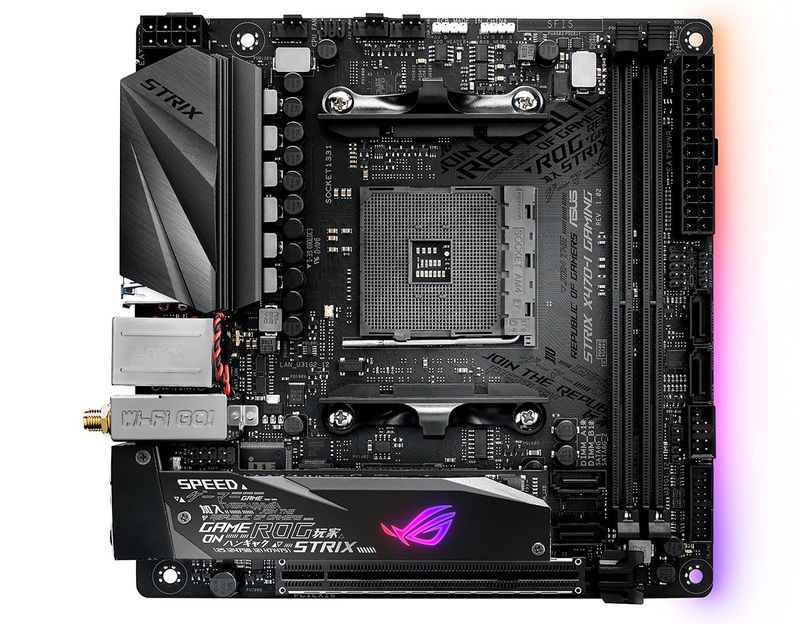 Enter the ROG Strix X470-I Gaming. This £175 board ships with a healthy feature set, including an M.2 heatsink, a further M.2 slot on the back, 12 edge LEDs for the oh-so-obligatory RGB, high-quality audio, Gigabit LAN, 802.11ac WiFi/Bluetooth 4.2, and a PCIe x16 slot. Getting all of these on to the form factor is no easy task, but after having had a play around with it for the last couple of days, Asus has done a reasonable job. Most Mini-ITX boards reduce the number of DIMM slots to two, just as Asus does here, though that is no bad thing given that you can populate 32GB easily enough and, given the price of DDR4 memory, you really don't need/want any more. The metal heatsink to the left is really solid but only makes partial contact with the power phases underneath. A neutral colour scheme lends itself well to range of coolers and memory, too. Asus sensibly groups the three fan headers at the top, and it's good to see that there's a specific one for an all-in-one watercooler. Getting to the eight-pin CPU connector is easier than on some full-size ATX motherboards because there's a small gap between it and the heatsink, plus it's rotated the correct way. There are a few compromises that come to light when installing components. Notice the two SATA ports between the RAM slots and heatsink? You can route a cable neatly enough from the bottom slot but it's awkward to do so from the top - the cable may run across the RAM if you're using a graphics card that inevitably blocks-off routing down towards the bottom. We'd also prefer the front-panel connector to be on the edge of the board. Rather, it's directly next to the outermost DIMM slot, making it fiddly to get the correct wires in place. No deal-breaker, but something to bear in mind. Strengthening-wise, the x16 PCIe is reinforced on either side but not on the top. What's better is the RGB support. 12 LEDs are evenly spaced underneath the right-hand side and provide decent illumination, controlled by the Aura Sync program; there's another four-pin RGB header for additional support and a further three-pin for WS2812B addressable RGB LED strips. You can choose whether to have the main LEDs on whilst the board is off or in standby. 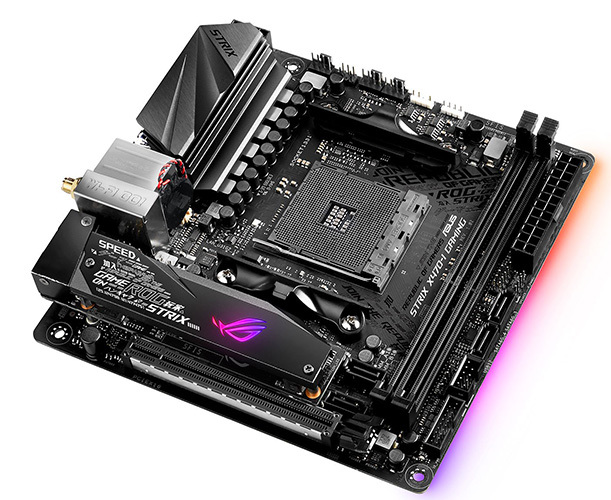 Though not a true enthusiast board, Asus finds space for a thermal sensor connector. Part of the reason for putting so much down this right-hand side is the rather large combo heatsink. There's a fair bit going on here. Eagle-eyed readers may have noticed the lack of an X470 PCH chip on show. It's located underneath the M.2 shield and has a low-profile heatsink of its own. That's all good, but there also needs to be space for the usual S1220A audio chip, and it's combined with the M.2 card in order to save board space. Adding a touch of dash, the audio ports also have lighting coming out of the back. The only thing we don't like here is the excess writing on this RGB-lit M.2 heatsink. As noted earlier, the PCIe x16 slot effectively blocks off clean cabling to the SATA port. This isn't such a big deal because the board features two M.2. We'd recommend using such a drive on the heatsink-clad side because it offers full-on x4 Gen 3 access. The slot behind the board, interestingly, doesn't work if you use a Ryzen 2xxxG-series chip, or if you go for an older 7th Gen Athlon. 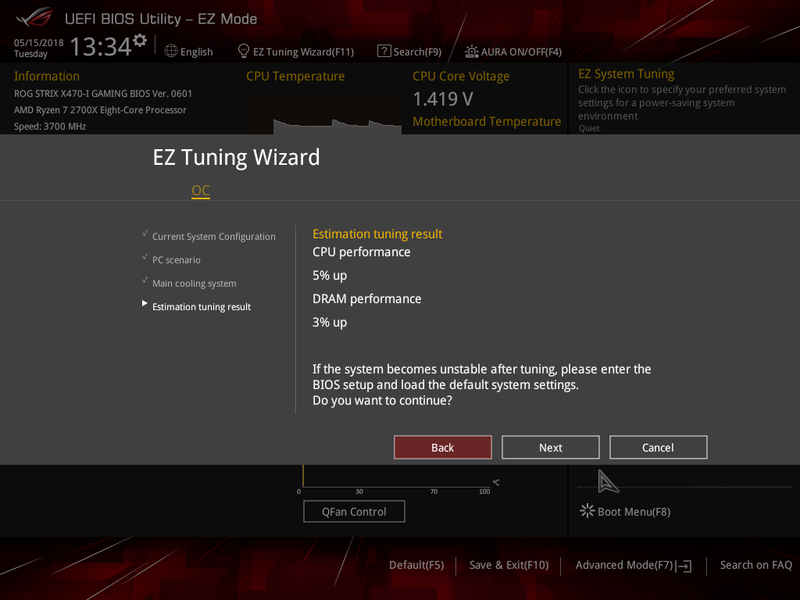 Even using IGP-less Ryzens results in compromise as running the M.2 at PCIe Gen 3 x4 results in bandwidth being halved to x8 for the PCIe x16 slot. Really, there's little point in using it at all. What else? 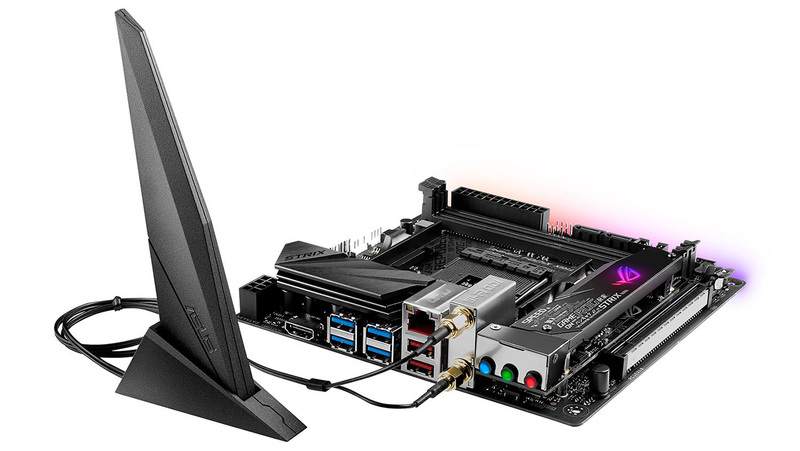 Asus sensibly includes an HDMI port for the aforementioned G-series Ryzens. 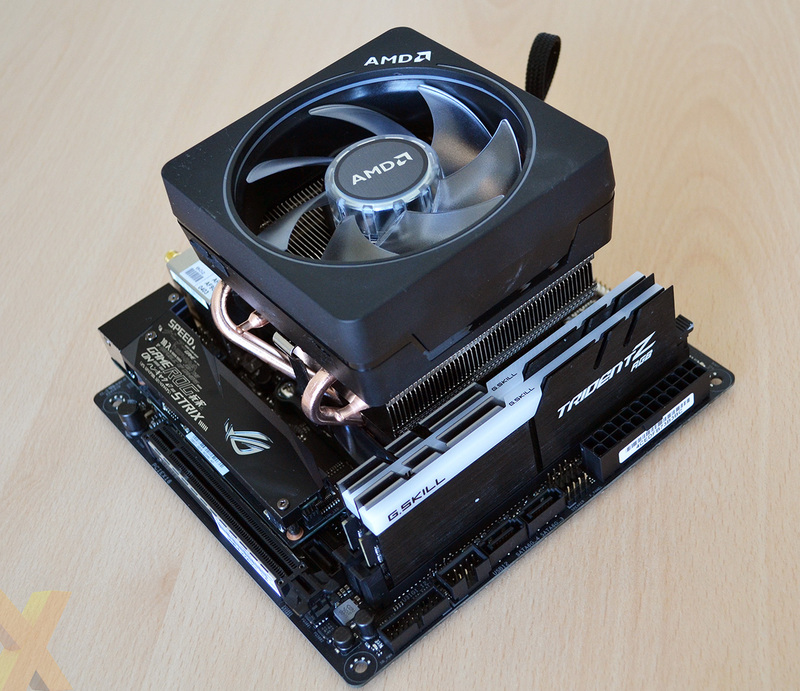 No Mini-ITX is complete without a combo WiFi/Bluetooth card. 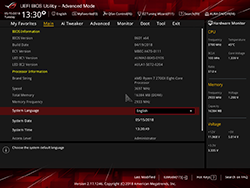 Here, Asus uses a Realtek 8822BE chipset rather than the Intel 9-series that offer faster speeds for both wireless standards. That said, a rather trendy antenna is bundled in the box. USB is something of a mixed bag. There are 10 supported ports, split between four USB 3.0 (blue, at the back), two further USB 3.0 from an edge-board header and primed for the I/O section of a chassis, two USB 2.0, and a couple of USB 3.1 Gen 2 (red) on the back. All come from the X470 chipset. Niceties such as USB 3.1 G2 I/O support go by the wayside. A quick peek at tweaking. 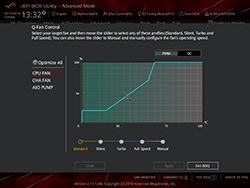 Taken over all the facets within a BIOS, Asus arguably has the best firmware. 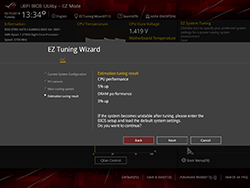 Fan control is excellent, tweaking is easy - though there's no obvious mention of XMP settings in the latest BIOS - while the EZ Tuning Wizard offers straightforward overclocking. 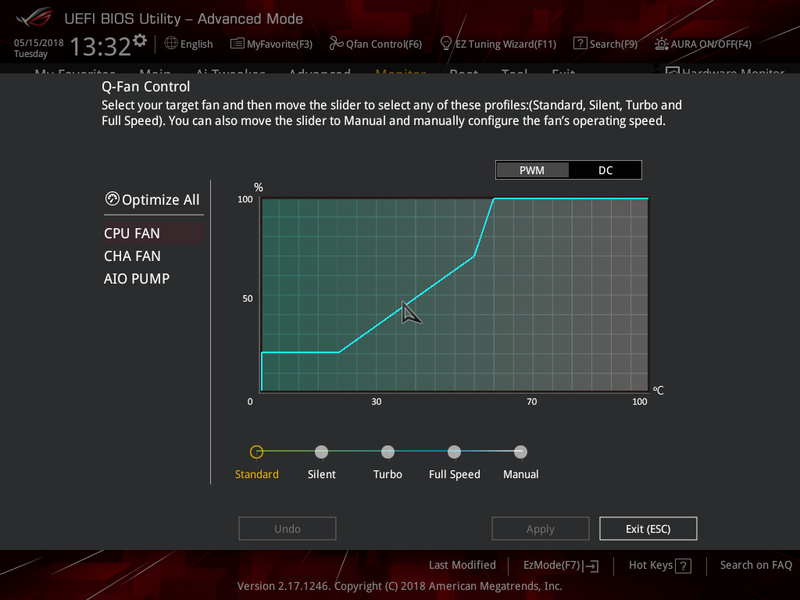 Asus continues to leave full-on RGB control for the Aura Sync application within Windows.